and we now have clear skies and sunshine so spirits are high for the Westward Look Show. 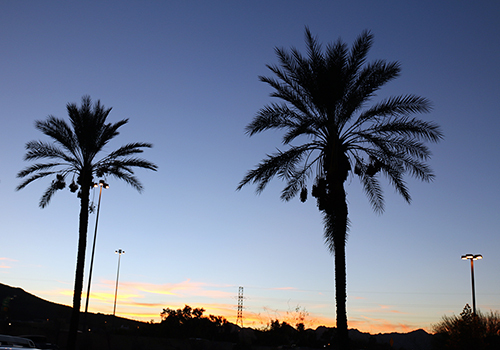 Palm Trees outside the Westward Look Resort, home of the fine mineral Show. Ian and Diana bringing in specimens for the display at Westward Look. ready for the specimens to be displayed. the Crystal Classics room at Westward Look. Diana working at the displays. 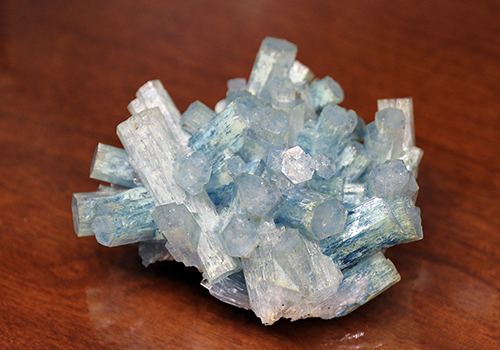 from Yaogangxian Mine, Yizhang County, Chenzhou Prefecture, Hunan Province, China. from Bergsig Farm 167 (Hohenstein), Omaruru District, Erongo Region, Namibia. from Florence Mine, Egremont, West Cumberland Iron Field,	Cumbria, England. from Le Burg Mine (Le Burc Mine), Alban - Le Fraysse Area Tarn, Midi-Pyrénées, France. 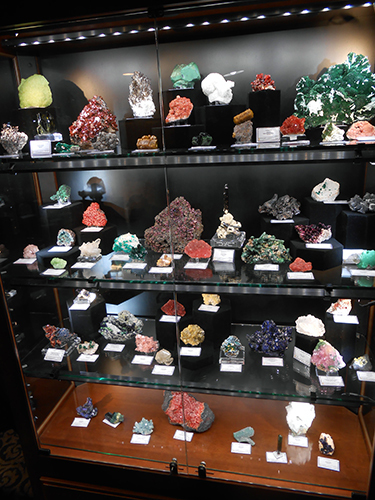 One of the drawers of fine small mineral specimens in the showroom at Westward Look. from Habach Valley, Hohe Tauern, Salzburg, Austria. Denton Mine, Illinois - Kentucky Fluorspar District, Hardin Co., Illinois, USA. from the Ala Valley, Torino Province, Piedmont, Italy. Native "Wire" Silver from Schneeberg, Erzgebirge, Saxony, Germany. Rapid Creek,	Dawson Mining District, Yukon, Canada. Alberoda, Schlema-Hartenstein District, Erzgebirge, Saxony, Germany. Another Proustite from the same locality with larger crystals. from the Rosenberg Mine, Braubach, Bad Ems, Rhineland-Palatinate, Germany. within the crystals that give the crystals their name. Here associated with double terminated milky white Quartz crystals. 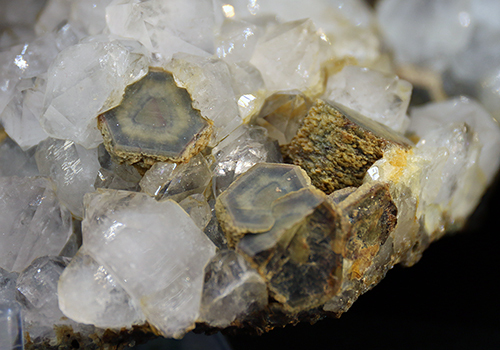 A closer look at the Siderite and Quartz pictured previously. 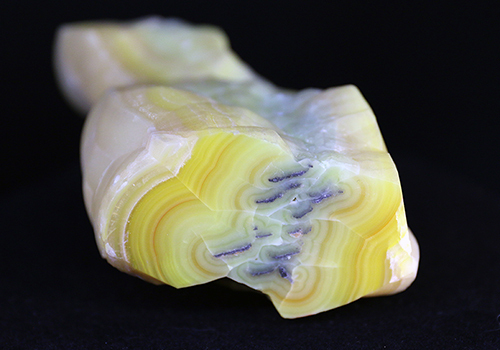 Bright yellow banded Smithsonite from Masua, Iglesias, Carbonia-Iglesias Province, Sardinia, Italy. The flat surface closest to the camera has been polished and measures approximately 2.1/2"
from Agrigento Province, Sicily, Italy. White coralloid growths of Aragonite Var. "Flos Ferri"
from the Styrian Erzberg, Eisenerz, Styria, Austria. from Calabona Mine, Alghero, Sassari Province, Sardinia, Italy. from Cavradi Gorge, Curnera Valley, Tujetsch, Grischun, Switzerland. and shows the typical etch markings and beautiful transparency characteristic of the location. from Saint-Pierre-de-Mésage, Vizille, Isère, Auvergne-Rhône-Alpes, France. and Quartz, from the famous Trepča Complex, Kosovska Mitrovica, Kosovo. with Hematite (or Ilmenite) at its core, sits on top of a terminated Quartz crystal. from Djebel Hammimat Mine, Ain Babouche, Ain Beida, Constantine Province, Algeria. from Stak Nala, Haramosh Mountains, Skardu District, Baltistan, Gilgit-Baltistan, Pakistan. 79 Mine, Chilito, Hayden, Banner District, Dripping Spring Mountains , Gila Co., Arizona, USA. A classic Little Three Mine Spessartine. from Cerro de Mercado Mine, Cerro de los Remedios, Durango, Mexico. Federally Administered Tribal Areas	(FATA), Pakistan. San José Mine, Oruro City, Cercado Province, Oruro Department, Bolivia. Tsumeb events - Tsumeb Forum. just 3 minutes drive from Tucson City Centre Hotel. The Centre was better equipped to accommodate the increasing popularity of the event. on "Charles Palache's Tsumeb Legacy"
The event was certain to be well attended. (L to R) Jeff Scovil, Ian Bruce, Malcolm Southwood and Raquel Alonso-Perez. 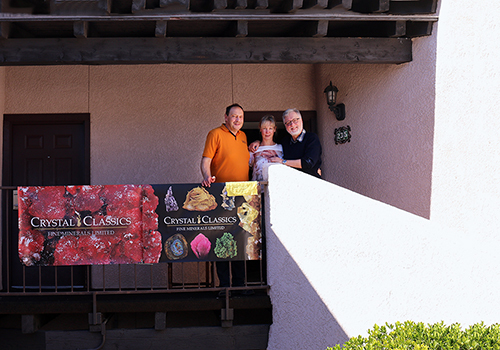 Dave and Debbie setting up the Crystal Classics Tsumeb Minerals Stand. 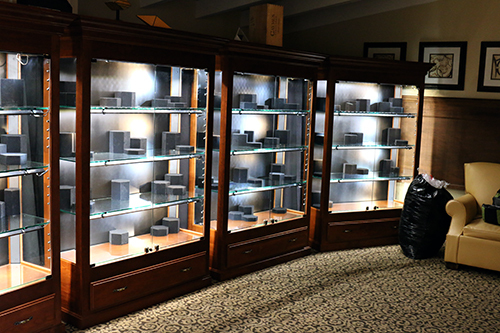 Collectors and dealers looking at John Veevaert's selection of Tsumeb specimens for sale. Shields Flynn talking Tsumeb with Ian. The Girls at the Mindat Desk with Tsumeb "T Shirts"
Malcolm with Debbie and Paul. Debbie at her work station. to be held at the Tucson Convention Centre. Stay tuned for some amazing mineral delights! !